The Greater Manchester Coalition of Disabled People’s (GMCDP’s) Young Disabled People Taking Action project started in January 2015 for young disabled people 18 - 30 and is funded by a legacy left by Kevin Hyett a founder member and treasurer of GMCDP who passed away in March 2004. Kevin was passionate about young disabled people being involved in all aspects of GMCDP’s work so it is was agreed young disabled people within the Greater Manchester area would be given the opportunity to become involved and be an important part in taking the organisation forward. In the summer of 2015 we were approached by Lorna Young (Chair of Manchester City Council’s Disabled Staff Group) who wanted our input to produce something as part of Manchester City Council’s (MCC) programme to mark UK Disability History Month (UKDHM) 2015. 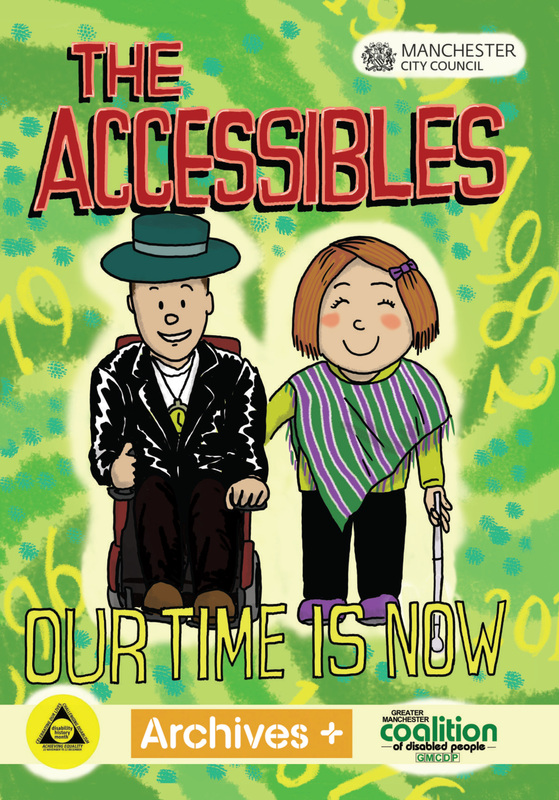 Working in partnership with MCC Disabled Employee Group and Central Library we began to explore the history of the disabled people’s movement keeping to the theme of UK Disability History Month – Portrayal of Disability in the Media: are we there yet? We were really excited about being given this opportunity and suggested designing and producing a comic with members of our group as key characters. Using time travel we were keen to observe key events and visit disabled people that we felt had influenced the disabled people’s movement over the years. In preparation we began to meet frequently at the GMCDP offices to carry out research and met at Manchester Art Gallery with local artist Jim Medway appointed by MCC who taught us how to draw characters, speech bubbles and supported us to convert our ideas into the comic we wanted. We would like to thank Lorna for this fabulous opportunity but must remember none of this would have been possible without Kevin’s legacy. We hope you enjoy reading our 1st edition and hope it will inspire others to get involved in the project and be part of “The Accessibles” future adventures!